Fan Friday Giveaway: Your Favorite Cleanser! What’s your favorite Mario cleanser? Would you like to win it?? What’s Chlorine doing to your skin? *One contest entrant will win their favorite cleanser. This contest is open to residents of the U.S. and Canada; you may enter to win this contest between August 23-25, 2013. We will announce the winner on Monday, August 26, 2013. I LOVE the enzyme cleansing gel! Makes my skin feel so smooth! My favorite MB cleanser is the enzyme cleansing gel! I love the way it removes all make up and dirt. It makes my skin feel so refreshed and energized after cleansing. Love love love!!! I’ve been obsessing over the enzyme cleansing gel for a while now! It’s the best facial cleanser on the market! It has changed my skin drastically– and I have people asking all the time what has helped my skin look so clean and clear! I recommend it to all my family and friends! So glad I found Mario Badescu! I absolutely love the Enzyme Cleansing Gel. My face feels so clean and I love the smell and feel of my face after using this cleanser. I will never use anything else! I love the enzyme cleansing gel! It is amazing for getting rid of any makeup on my face and its also great for my sensitive skin! I use this, acne cleanser, and glycolic cleanser in rotation to keep my skin refreshed! My favorite MB cleanser is the acne facial cleanser. MY skin feels so clean and refreshed and it keeps those pesky little bumps away. The enzyme cleansing gel!! I have been using it for 6 years and I LOVE it!! My absolute favorite is the enzyme cleansing gel, makes my skin feel clean and alive, I love it! Glycolic Foaming Cleanser is the best!!! Oh this is a toss up. I LOVE the orange cleansing soap AND the glycolic foaming cleanser. I switch between the two based on the needs of my skin. They are AMAZING!!!!! Love the enzyme cleansing gel!! So great for my oily skin. LOVE the Enzyme cleansing gel! MB is the first skin care line that I’ve used in my 36 years on this planet that has actually worked well with my skin. Jennifer, please contact me at [email protected]. You’re the winner!!!! I couldn’t live without my enzyme cleansing gel! I use it every morning and night to clean my face…when I don’t do it I feel like my skin cant breathe! Simply the most gentle product I’ve ever used but it doesn’t strip my face..it actually rejuvenates it! <3 <3 <3 my Enzyme cleansing gel! I can’t decide….. I have tried 3 facial cleansers. It’s a tie between the Enzyme cleansing gel and the seaweed cleanser. Either way, I’m so thankful to have found Mario products. I just got my first shipment of Mario Badescu products 2 days ago and I’m so thrilled with the results already. And the best part is that I started getting compliments about my skin after one use, which is unbelievable! And hands down my favorite product is the Enzyme Cleaning Gel. It leaves my skin so smooth and soft. I’m a customer for life! My favorite is the KERATOPLAST CREAM SOAP. It really helps out my red and dry skin. I used to be very insecure of my face. Now I love going out in my glowing skin! Cucumber cream soap. Creamy and gentle, yet gets the job done. Removes all my makeup and leaves my skin super soft and refreshed! L-O-V-E your cleansing milk with carnation and rice oil cleanser. It’s the only thing I can knowingly clean my face with and not feel like the sahara desert with afterwards, not to mention, it doesn’t break out my face! I love, love love the Cream Soap, it is safe and gentle for my mild rosacea and it doesn’t strip my skin’s moisture plus it cleans thoroughly and keeps my skin supple and hydrated at the same time! The glycolic foaming cleanser is the bomb! Feels and looks like fresh from and facial refreshed. You can’t go wrong with anything from the Badescu line. Happy, Happy, Happy ! I know that this will likely be a popular response, considering the greatness of this product, but I absolutely love the Enzyme Cleansing Gel. My skin is very oily and often skin consultants try to remedy that with harsh foaming cleansers. The problem with these is that they over-strip the skin of its natural oils, causing the skin to actually produce more oil (sometimes leading to more breakouts). This cleanser does an excellent job of cleansing while leaving the harmful sulfates behind! I also love that it contains natural AHAs, which encourage cell turnover (great for blackheads, preventing acne, and even wrinkles). All in all, Mario Badescu has done an incredible job in creating this cleanser that is great for so many skin types. The icing on the cake? It’s super affordable price!! Have to correct misuse of apostrophe! Acne facial cleanser is my daily go to, but I also LOVE the glycolic foaming cleanser. Both leave my skin softer, smoother, and clearer than ever before! I got a sample of this and it’s great! Definitely one of my favourite Mario Badescu products! I’ve become obsessed with the MB Enzyme Cleansing Gel (so has everyone else, it seems! ), and it will forever be what I use on my face. When I use this gel, my skin literally feels like it is singing! I get more compliments on my “glowing skin” since beginning my skin regimen, than anything else in my wardrobe, and I thank you Mario Badescu! I would love to win the seaweed cleansing soap. I have combination skin and this cleanser works great at calming my skin and keeping break-outs at bay. This cleanser is amazing!!!! Keratoplat cream soap. Calms my itching, dry eczema. Helps to control the rash….thus improving my confidence!! 🙂 I would recommend to anyone with sensitive skin. The price is great along with fantastic results!!! The Mario Badescu specialist I talked to recommended the enzyme cleansing gel, but I haven’t had a chance to order it. I would love to win it! My HG and favorite cleanser is the Glycolic Foaming Cleanser. I am now on my 3rd bottle. I have acne-prone skin and I used to have (before using this cleanser) huge pimples. After using this, I get zits every week especially on my cheeks but this cleanser dries it up and in a few days my pimples and the scars are gone! Amazing! People have been seeing great results on my face. I don’t need any foundation or concealer to cover it up! It brightens my face and gives me that fresh look which I really like. Adore the Enzyme Cleansing Gel- delivers fresh clean bright skin. Can I take a moment to applaud Silver Powder too– holy smokes I’ve never had a product that worked so quickly and thoroughly before. Keep on delivering solid products Mario B! I have been loving my Kerotoplast cream cleanser. It gets the makeup and dirt off, but doesn’t leave my dry skin stripped or tight. I love enzyme cleansing gel. My skin looks better than ever. The Enzyme Cleansing Gel – no matter what my age, it seems to work perfectly for me. Never feels to tight, but leaves your skin fresh and clean and gently moisturized. I love that fresh glow I have after using it. I have normal skin with an oily center panel and it works perfectly. Enzyme Cleansing gel is my favorite ! smells awesome , and my skin is so nice and soft ! I actually use an array of products from Mario Badescu during the week and I think it has really helped me completely change my skin. Back in Mayish I decided I was going to dive into Mario Badescu products. I had congested skin, horrible acne around my mouth, I use to be a lifeguard so some signs of sun damage. I am getting married in 6 weeks and I decided I had to find something to fix my face. Anyways, I use the carnation milk cleanser every night to get my makeup off, and every morning I switch between the enzyme gel cleanser and the glycolic cleanser. I literally DO NOT GET ANY breakouts anymore, I went from having 10 at all times to NOTHING. People have been complimenting me on my “radiant skin,” which is unreal to me because my skin was HORRIBLE. I will never go back to any other cleanser EVER, NEVER, you have a forever consumer here. I will mention that I wish the products I use didn’t have parabans in them but I guess it’s the price I pay for vanity. The Glycolic Foaming Cleanser is amazing! My skin always feels so smooth afterwards and stays oil-free longer, which is great, I hate my oily skin! It works well on my boyfriends back too. I love the Enzyme Cleansing Gel! Would love to win. Thank you, Mario Badescu! My skin turned a corner when I began using the Botanical Cleansing Gel. I went from occasional breakouts to none! It doesn’t give you that tight, over stripped feeling that soaps cause. I am loyal for life! I have had cystic acne forever. I started using a great deal of your products and noticed a huge difference. Then i got your Acne facial cleanser. I have a face now that i catch my husband staring at and smiling every once in a while. I do that, too, in the mirror. I can’t believe the difference! My baby touches my face, and tells me, “mommy, you’re soft”. I used to have bumps all over my face! I used to wear a lot of make up to hide my face for the huge pimples I had. Now, I wear no make up. I’m proud to be naturally beautiful. I work as a soon to be RN, and make up is quite a bad idea for a twelve hour shift on the floor. Now, my patients see the real, genuine me! 🙂 All your products, especially the acne facial cleanser, made that possible. I (nor my hubby, children or patients) cannot thank you enough! After so many years with disgusting, huge acne, you have made it possible for me to feel naturally beautiful! I <3 Mario Badescu! I would love to win the make up removing cleanser, because I love your products but have yet to try the cleanser! It’s the only missing part of my set! Plus it’d be an amazing birthday gift! My bday is Wed! I love the Orange cleanser. My skin drinks it up! Also the smell is intoxicating. The glycolic cleanser is an AMAZING addition to my MB skin care routine! I use it 2-3 times a week and it adds that extra oomph to clean deep down! I have to say the enzyme cleaning gel. My skin feels soft, clean & tightened! My ultimate fave is the enzyme clensing gel! from the smell to the feel its just fabulous! i love the fresh smell that makes me just want to lather it up on my face and leave it on. It’s not foamy which I love so it doesnt dry up my skin…Ultimate Fave! I am loving the acne facial cleanser. I would love to try the glycolic foaming cleanser. I like the Enzyme cleaner, my skin feels really refreshed and soft afterwards, and I love the smell! From the first facial I received, I have loved the Enzyme cleansing Gel ever since. From the ease of use, the way it removes makeup and even eye makeup to the fresh feeling when it dries. I have recommended all of Mario basescu products to my friends and family! I love the acne facial cleanser it has really cleared up my skin. After having my first baby my face went through a hormonal change and the acne cleanser was there to help manage it. It’s very gently yet affective! I’m having a love affair with the enzyme cleansing gel; I’m pretty sure I’ve found the one. It leaves my skin feeling so soft and clean without drying it out or the uncomfortable stinging sensation. It’s an essential part of my beauty routine that not only makes me look nice but feel beautiful. the acne facial cleanser, because it’s so soft and gentle but yet gets the job done. Just ran out of my enzyme cleansing gel this morning!!! I would LOVE to be re stocked!! I’m obsessed! I’ve had problem skin since I got pregnant and had her 7 months ago! This has changed my skin in so many ways! Thank you Mario Badescu!! Xoxo! I like the Glycolic Foaming Cleanser because of the glycolic acid for exfoliation and the herbal extracts for soothing my face. The enzyme cleansing gel! Love how clean it makes my skin feel! I LOVE the enzyme cleansing gel. Not too harsh and not too sensitive for my tough skin. It is hard for me to pick one product. I have been using this products for 20 years and I love them all. If I had to pick one, it would be your Vitamin C serum. As my skin ages, I notice more brown spots coming out. This serum is wonderful for these spots and fades them quickly and safely. I can not live without my Mario products. I’ve been using the Enzyme Cleansing Gel for years. I have acne rosacea, and every cleanser I’ve ever used has either caused breakouts or made my face dry and itchy. But since I’ve been using this cleanser, my skin is calm, clear and silky. Enzyme Cleansing Gel is literally a godsend for me! I love the Keraplast Cream Soap. It doesn’t dry out my skin and balances the redness. The Foaming Glycolic Cleanser, hands down!! It works so well to get rid of old skin and pore-clogging residue, yet it is so gentle on my sensitive and blemish prone skin. It’s the only cleanser that I’ve found to truly cleanse and not over dry my skin or make my blemishes worse! Love these products…every one we try! I really love the way the enzyme cleansing gel makes my skin feel!!!! It’s amazing!!! I love the Glycolic Foaming Wash! I just turned 40 a couple of months ago and the signs of aging combined with my dull, congested, break-out prone skin (yes, still break-outs @ 40!!) have made my skin difficult to deal with. My skin seems to do very well with the Glycolic cleanser. I’m seeing a lot of improvement in the texture and appearance. Thank you, thank you, thank you! I was about to throw in the towel!!! I LOVE the cucumber cream soap but I’d really like to try the Keratoplast. I have very dry skin! The enzyme cleansing gel! Woot woot…love it! I love your Enzyme Cleansing Gel & Glycolic Foaming Cleanser. I just ran out…Gggrrr…I want to switch to Acne Facial Cleanser coz Im getting on and off blemishes. I want to maintain a clear skin face. =) Thank you Mario Badescu. You’re my first and one of my favorite skincare now. I have sensitive/combo/acne prone skin. I love the Enzyme Cleansing Gel. It’s non-lathering formula removes every trace of makeup and dirt without irritating my skin or making it feel tight. I <3 mario badescu! Why the enzyme cleansing gel, of course! But I’m also interested in trying the seaweed cleansing or orange cleansing soap. Love love love the Glycolic foaming cleanser only thing that helps my post acne marks!! The Enzyme Cleansing Gel!! its perfect for my sensitive skin 🙂 LOVE IT! I have been using the ACNE FACIAL CLEANSER for a few months now and it is my favorite! I love it because it controls my adult acne, doesn’t dry out my skin, and it leaves my face feeling fresh and clean! My fav MB cleanser is definitely the Enzyme Cleansing Gel because it does not strip my skin. It balances my oily skin and helps keep breakouts away. It does not irritate my sensitive skin and leaves it refreshed. The enzyme cleansing gel helps my skin to stay smooth, clear, and refreshed. I haven’t yet tried the cleansers, but the two that catch my eye the most are the glycolic foaming cleanser and the enzyme cleansing gel. I love acne facial cleanser!!! It leave my skin nice and clean & it also helps me prevent acne which is the most important thing!! I love the glycolic foaming cleanser. It keeps my combo skin under control and cleans gently, but effectively. My pre teen daughter recently started to break out in her t zone and she now uses this cleanser, as well, for clear skin. And a little goes a LONG way. I buy one bottle every 2 months. Enzyme cleaning gel….awesome!!!! No other way to describe it…..simply awesome…. I love the botanical cleansing gel! It has really cleared up my acne-prone skin! My new favorite cleanser is the acne facial cleanser. I used cream cleanser for years and never had acne. As I’ve gotten older my skin has changed and started getting some small breakouts on my chin. The girl where I get my MB recommended acne facial cleanser and it totally cleared up! Love it! I love the enzyme cleaner after working out, it really gets all the grime out! I love the Enzyme Cleansing Gel. Perfect for my skin and really a great bargain. I recommend it to anyone, especially those who complain that everything else makes them break out. I love the Orange Cream cleanser. I have super sensitive skin that is easily irritated. It feels so great and leaves my skin so clean and free of make-up and the days grime. LOVE LOVE LOVE Keratoplast Cream Soap !!! I use the enzyme cleansing gel and love love love it!! I would LOVE LOVE LOVE to Win a bottle of the Glycolic Foaming Cleanser! I wash my face with it twice a week and three times if my skin is being very problematic because I have combo/oily/acne prone skin, it’s simply one of the best cleansers I’ve ever came across that takes off all my makeup, smells heavenly and doesn’t make my skin feel tight and dry. My favourite is the glycolic cleanser. Lots of my friends recommended this and it is great stuff! I love all your cleansers, and my go-to favorite is the Enzyme Cleansing Gel. It doesn’t strip my oily skin and it removes all impurities from the surface, while deep cleansing my pores. I feel refreshed, and my face looks radiant! Thanks for making such a great product! I use the Botanical Cleansing Gel and it feels so smooth and natural on my skin. I can feel the difference instantly. I had a toss up between getting it or the Enzyme Cleansing Gel. I would love this opportunity to get the Enzyme Cleansing Gel or the Seaweed Cleansing Gel!! I use the Seaweed Toner and its amazing (about to get a replacement) and wo set if it would be more amazing with the matching cleanser and night cream. I love you Mario Badescu keep on making the best cleansers!! The Acne Facial Cleanser has changed my life. I have had acne my whole life and thought I just had to live with it. My face is now the clearest it has ever been! I love the orange cleansing soap!! I’m so glad the mario badescu products don’t break out my sensitive skin!! I love the Acne Facial Cleanser! It really helps to keep my skin oil-and-blemish-free! I have struggled with adult acne for years and the Mario Badescu line is the only that has ever done anything to treat it! Avene Gentle milk cleanser keeps my skin clean and it’s not drying. The enzyme cleansing gel is my favourite. It smells so good and my skin feels amazing after using it! Enzyme Cleansing gel, can’t go a day without it! Love it! It looks like I am not the only one singing the praises of the Enzyme Cleansing Gel. It does wonders for all skin types and truly is an invaluable find! The Cream Soap is THE only non-irritating cleanser I can use when I have a rosacea flare-up. When my skin is behaving, I regularly use the Keratoplast Cream Soap and occasionally the Orange Cleansing Soap. I wanna free cleanser! I like the Acne Facial Cleanser since it helps to keep my breakouts in check! Hands down, it’s the Enzyme Cleansing Gel. If I foolishly run out while waiting on my next order, I notice a difference in my skin within days. It’s gentle enough to use on my skin all year round. I have recommended it to so many friends and each one loves it as much as I do! Love the enzyme cleansing gel. Its been great for my oily but sensitive skin. Enzyme Cleansing Gel! It’s hard to find a natural cleanser that takes out a little oil, but doesn’t dry you out! Would love to win a bottle! My favorite is the Botanical Facial Gel because it’s smells great and really works! The Glycolic Foaming Cleanser is my favorite because it cleans well but is gentle on my skin. Glycolic Foaming Cleanser is my favorite because it makes dull skin more radiant. I cannot decide between the orange cleansing soap and the enzyme cleansing gel! both have made my skin radiant and fresh! I love the enzyme cleansing gel…it’s the ONLY product that works for me. I breakout with everything else! My fave is the enzyme cleansing gel! It cleans my face so well without overstripping and it has wonderful nourishing ingredients too! I am in love with the Enzyme Cleansing Gel! I cant get enough of it. Complete Awesomeballs! Love Love Love it! I love the Cucumber Cream Soap because my skin feels so clean and refreshed after using it! Keratoplast Cream Soap because from what I read it’s best for my sensitive skin. Glycolic Foaming Cleanser is amazing, my skin feels smooth, soft and my dark spots have lightened. Its my magic bottle for clear skin. I LOVE the cucumber cleanser because the cucumber in it is so soothing to the redness and blotchy areas in my skin! I like the glycolic foaming cleanser – gentle and strong at the same time! The glycolic cleanser is a great product, especially when used with my Clarisonic. Have not tried the enzyme gel, but from the rave reviews, look forward to trying it. I love the Seaweed Cleansing Soap. My favorite is the glycolic foaming cleanser. Hmmm, torn between Enzyme Cleansing Gel and Glycolic Foaming Cleanser. I use both and love them. But if I HAD to choose, I’d probably say Enzyme Cleansing Gel. My favorite MB cleanser is the acne facial cleanser. -My skin is very soft and clean. The Glycolic Foaming Cleanser is the best cleanser for deep cleaning whenever my face feels/looks dull and is the best cleanser to pair with My Clarisonic. I am down to more than half of this cleanser and I’ve had for quite some time now, so that’s why I REALLY want to Win My Favorite Cleanser because a little goes a long way, cleans deep without irritation and it last for quite a good amount of time! In preparation for my wedding in November, I decided to really do my homework and find the best products for my skin. Mario Badescu has come through for me in a big way. The Glycolic Foaming Cleanser has made such an improvement in my complexion (think: clear, fresh and exfoliated, less oil), that I know without a doubt I’ll have it, in part, to thank for my ‘bridal glow’ on the big day! I have red/dry skin and the keratoplast cream soap works wonders for me! Love the Seaweed Cleansing Soap! Nothing else makes my face feel so clean. Love all the Mario products I’ve tried! I love the enzyme cleansing gel 🙂 It’s so gentle and removes all the make up from my face. I have had issues with other cleansers drying out my skin but not M.B products. Love them ! 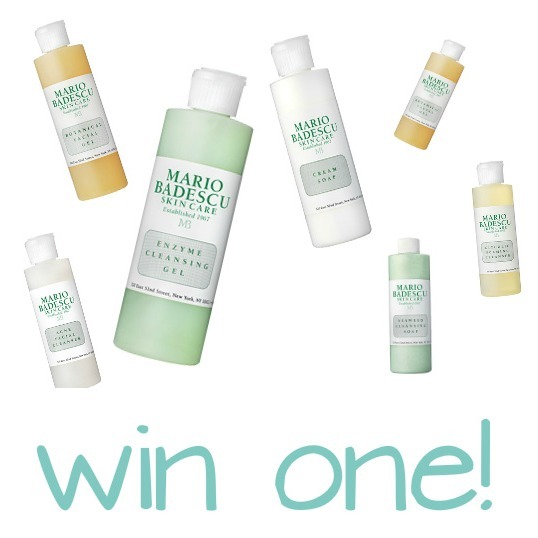 My favorite is the Enzyme Cleansing Gel.I love Mario Badescu products and hope I win. The enzyme cleansing gel is my go to cleanser. I also use the glycolic wash twice weekly. I’ve converted to this brand and LOVE it!! I like the Enzyme Cleansing Gel. The gel has a very fresh scent and I enjoy the color/texture of the product. Mario’s Enzyme Cleansing Gel doesn’t dry my skin out or irritate it. If you haven’t tried it give it a shot. They often do free samples. I like the Enzyme Cleansing Gel because not only is it gentle but it also has a very exfoliating effect. Cucumber cleansing cream is my favorite. It is so mild and moisturizing, affordable and lasts a long time- a little is all you need for a rich lather. I love the Botanical Facial Gel! It has improved my skin so much. Thank you Mario Badescu for making great products! I don’t have a favorite yet, but if I win this giveaway – I may find one!! Enzyme Cleansing Gel is my favorite because it cleans my skin without leaving it greasy. I love the seaweed cleanser! The Glycolic Foaming Cleanser works best at removing the humid Miami days from my face day in and day out. I love the Enzyme Cleansing Gel. It cleanses without stripping my skin and leaves it feeling so soft and smooth. I must sound like everyone else but I love the enzyme cleansing gel, that being said it must be amazing because everyone that uses it loves it. I use it and follow up the the cucumber toning lotion and aloe moisturiser and its the basis for my skin care staples. The Enzyme Cleansing Gel! I started out using the Acne Cleanser, but got a sample of the Enzyme Cleansing Gel and liked it so much I bought it too! I love love the Enzyme Cleaning Gel!!! It has really helped to keep my adult acne (from PCOS) at bay. Nothing (and I mean nothing) else has worked! I alternate between the Enzyme Cleaning Gel and the Seaweed cleanser. My skin feels fantastic! I have not had a chance to try any Mario Badescu cleansers, but based on the comments I have read tonight, there’s a lot of love out there for your products! For “Putting your best face forward.” the Mario Badescu cleanser I would like to try first is the Enzyme Cleansing Gel! Thanx! love the enzyme cleansing gel – makes my skin feel tingly clean! I love that scent and smooth feeling of the enzyme cleansing gel. My face is looking radiant after a few months use!!! But I can’t forget to mention the A.H.A. Botanical Body Soap because it does wonders for my body. Acne Facial Cleanser! I work in front of ovens and grease all day and nothing compares to how well it cleans it all away including my makeup! Definitely the Enzyme Cleansing gel. It’s perfect for evening out my skin tone and giving me that soft, clean feeling at the end of the night and leaves me feeling refreshed in the morning. To me, it’s the perfect cleanser! My favorite is the enzyme cleansing gel – it makes my skin feel so clean & fresh. I love Enzyme Cleansing Gel. Works amazingly well. It cleans without over drying. Glycolic Foaming Cleanser it feels really good on my skin and inproved the appearance of my acne scars. My favorite cleanser is the glycolic gel cleanser because it’s so gentle on your skin and it doesn’t have any harsh ingredients. It also deep cleans your pores making them look smaller! My fave is the acne facial cleanser! Hmmm…so do I have to pick ONE favorite cleanser?? ?Depending on the weather, how much make-up I’ve worn, what’s going on with my skin, whether it is morning or bedtime…I reach for a different cleanser. I love the Seaweed Cleanser when my skin is feeling a little bumpy; the Orange Cream Cleanser when I feel dry; the Keratoplast Cleanser if there is a little redness; Enzyme Cleanser when I want to get extra clean. But, if I had to choose just one, it would be the Glycolic Foaming Cleanser, which leaves my face feeling clean, smooth and ready for the day. I love them all, but that is the one I would take if I had to leave the others at home!! Glycolic Foaming Cleanser has been awesome at keeping my pores unclogged and my skin radiant. Keeping blackheads at bay and pores small seem to be a full time skin care job for me, and this cleanser has really helped. My favorite cleanser is the Enzyme Cleansing Gel because it is very refreshing! The Enzyme Cleansing Gel is my absolute favorite! It leaves me feeling so refreshed! The Orange Cream Cleanser, great scent and it really moisturizes deeply. I love Orange Cleansing soap. It leaves my face feeling soft and fresh, and it smells wonderful. My favorite is the glycolic cleanser! Oops! Because it deep cleans but does not strip my skin of moisture. Hi, I would love to win this…but is never happening! I would love to win the Milk Cleanser with Carnation and Rice Oil! This is a fantastic gentle cleanser which leaves my skin nicely hydrated, soothed and glowing. I have incredibly sensitive skin. I have tried so many products in my life and in doing that I have wasted a lot of money. I was always looking for something that wouldn’t cause me to break out. But that was hard because then it would dry my skin out causing my skin to produce more oils and then I would still break out. A friend had tried Mario Badescu and had success and told me to try. I went online answered some questions and it suggested the Enzyme Cleansing Gel. This has been the only cleanser to work for me. I can’t go without out it. I strictly use Mario Badescu products and the results have been better than any other I have tried. The Seaweed Cleansing Soap because it’s gentle enough to not break me out and strong enough to cleanse my face! Enzyme Cleansing Gel. It really makes me love my skin. This Gel makes my pores invisible. Enzyme Cleansing Gel…cleanses my combination skin so well & leaves it soft! Enzyme Cleansing Gel for sure is the best! The Seaweed Cleanser is the absolute best. My skin is extremely sensitive and this cleanser is very gentle. My new favorite cleanser is the Enzyme Cleansing Gel, I love how it feels so light while I’m washing my face and my skin glows after I wash it off. the enzyme cleansing gel is so refreshing and i love the scent! Love your Botanical Facial Gel for that deep clean! I absolutely LOVE the Seaweed Cleansing Soap! I use it twice daily, in the morning to wake my skin up, and before bed to take off any makeup that my Carnation Eye Makeup Remover Oil might have left behind. I love how creamy and moisturizing it is on my skin and I follow this, with the Aloe Vera Toner. My favorite is the Enzyme Cleansing Gel! It cleans my skin thoroughly but does not leave it dry. My face feels clean and refreshed and has a beautiful soft glow to it. My favorite toner is the alpha grapefruit cleansing lotion!!! It cleans deap my skin and feels like heaven!!!! I love the alpha grapefruit cleansing lotion!!!! I feel my skin so clean!!! A brightening cleanser! Haven’t tried yours or if u even have one! I have not tried this one as of yet?! But love so many of your other products..My skin feels so soft and refreshed. So far this product line is the best I have ever used!! I love the enzyme cleansing gel so so much it’s my fav out of every thing In the world!!! !